Chiropody involves the assessment, diagnosis and treatment of the toenails, calluses and corns. Some patients may have very painful corns. These may be a ‘neuro-fibrous’ corn, i.e. there is scar tissue and nerve endings very close to the skin surface. These type of corns need to be treated gently and sympathetically to help them to improve the symptoms. Toenails can become thickened and difficult to trim with damage over the years. Chiropodists use a small drill to thin the nail plate down to a more normal thickness. Fungal toenails are also a problem, these often require trimming and thinning out in preparation for using anti-fungal nail lacquers to help cure the fungal infection. Advice on skin problems and footwear helps in the long-term management of foot problems. Diabetes is becoming more common in our society. Diabetic patients need to look after their feet as they may be prone to poor circulation and loss of sensation, (neuropathy). Hence, if their foot is injured it may not heal as fast and may be more prone to infection. A diabetic foot screen is available to help check and monitor the status of a diabetic’s patient’s feet. Foot health advice and care is an important area for Diabetics. This minor operation helps to resolve persistent ingrowing toenails. It is carried out under a local anaesthetic and a chemical is used to destroy the nail bed so that the nail will not re-grow. 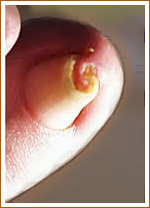 Most people only require a small section of nail to be removed, a partial nail avulsion. This helps the cosmetic appearance and also leaves some nail to protect the end of the toe. 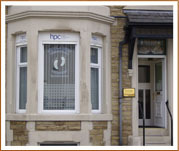 Post-operative care is carried out by the patient and monitored by the Podiatrist until the toe is healed. Podiatrists trained in acupuncture may be able to help with foot and lower limb pain. It may be used to help diabetic neuropathy or musculo-skeletal pain. Acupuncture involves inserting very fine needles into certain points on the body to try and improve symptoms. It has been shown that acupuncture stimulates the brain to produce natural pain relieving chemicals. All needles used are single-use, pre-sterilised and disposable.